Originally trained as a cellist, Friedlander has composed music for ads, dance works and scored feature films (Future Weather , Oh Lucy! ) and documentaries (Nothing On Earth ), as well as creating a number of projects for other musical disciplines. Thoroughbreds is a sparse score that is dominated by a variety of percussion instruments (played by Satoshi Takeishi) that is peppered with additional musical colours including prepared piano (played by Sylvie Courvoisier) and a small ensemble of strings (including cello). Both Takeishi and Courvoisier are known as music improvisers and Friedlander’s score feels very much an improvised score in that it’s difficult to know the path each cue is going to take. The opening album track, “Finding Mom”, establishes the whole feel of the overall score. Various types of drum combine in intricate rhythms to create a rich pattern of beats. These complex arrangements are interspersed with quick stabs from solo strings and occasional bells. Whilst preparing for this review I read one film reviewer mention that they had failed to see the connection between the movie’s plot and the title, Thoroughbeds. I am not sure whether this was deliberate or not but Friedlander’s quirky use of strings has a sort of equine quality to it. In the aforementioned opening cue, we hear a neighing motif from the cello, and in the following score track (“Cycle Treachery”) there’s a sound – similar to the noise I imagine a distressed horse would make – from what I presume is also some sort of stringed instrument. Over the course of the score strings play an important part in giving an unsettling atonal aspect to the music. Dissonant string phrases in “Thoroughbred” punctuates a sparse 3-minute cue for various percussion instruments plus the presence of a mournful, slow tempo drum. (The presence of a significant amount of silence in this cue gives “Thoroughbred” and distinctly Japanese feel to it.) “Break Point” features scratchy atonal strings alongside loose-stringed bass guitar twangs. This cue appears to be electronically modified to cut off the sounds before they have a chance to develop and resolve. This gives the music an unpredictable feel to it. “Take Tim Down” contains the score’s drums’ most organised sequence of playing. There’s an energy here that’s not seen much in the rest of the score and it’s a pleasant break from the cacophony (not meant to be taken in a negative way) of musical ideas heard elsewhere. Towards the end of the score, “Fraying At The Edges” offers a clear distinction from the rest of the score. Whereas there’s a sparseness to the rest of the score (e.g., the long silences heard in “Thoroughbred”), “Fraying At The Edges” features a ‘wall of sound’ quality to it that assaults the senses: electronic loops and sustained string tones meld with the ubiquitous percussive elements. The score closes with “Unstable”, which contains the nearest the score gets to a melody. Hypnotic, but somehow sickening, strings underpin a music box-like melody (which itself doesn’t quite sound innocent) that clearly gives the impression that everything is not as well as things at first appear. This is an intriguing little score from Friedlander. When I first listened to it I was initially turned away by the seemingly unstructured music. However, the more I listen to it the more I am drawn into the whole palette of sounds and ideas put forward. The album – released digitally by Back Lot Music – contains only 19 minutes of Friedlander’s score and I was initially disappointed that there was so little music available. But thinking about it further, I am not sure that any more would add to the listening experience of these nineteen minutes; in fact, more music could be a good example of the law of diminishing returns. Less is definitely more in order to enjoy the score. The album is padded out with a number of songs which – I presume – feature in the movie. It didn’t take long for me to edit out most of the songs as they are so different from the score. The songs are liberally distributed throughout the album and (for me) ruin the mood Friedlander is trying to achieve. Canadian Tanya Tagaq’s 2015 song “Uja” is of a song that does fit well with the score. Known as a throat singing performer, the dexterity of her voice (which here has a percussion-like quality), together with the strong rhythmic beat of the track, means that “Uja” could comfortably have been part of Friedlander’s original score. Thoroughbreds could easily have been released as a 20-minute extended soundtrack EP; a format that is becoming increasingly popular for the more obscure soundtrack album release. 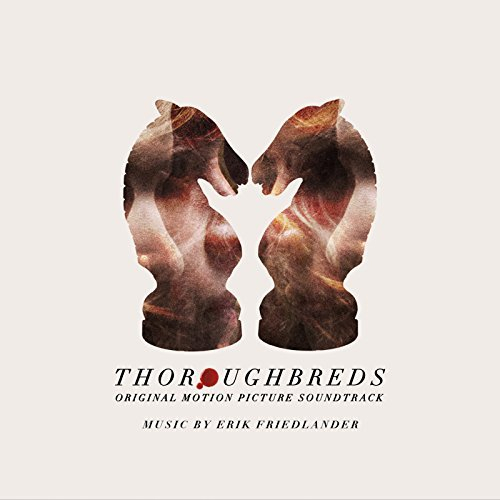 In the end, Friedlander’s score for Thoroughbreds is an entertaining and interesting listen and is recommended to those who want to hear something different. But the album loses a few points for the inclusion of some atmosphere-ruining tracks. Thoroughbreds can be downloaded from the usual digital scores and audio clips are available to sample HERE. The score is also available to stream from services such as Spotify.